On Oct 16 the Danish navy auxxiliary "MHV Saboeteuren" (MMSI: 219000554) inspected the grounded "Bornholm" and found no signs of oil spillage. 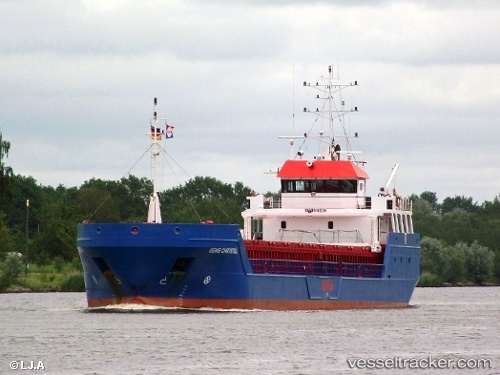 In the evening, the ship was refloated and pulled to the port of Randers where it was detained for further surveys. She left the port of Randers after inspections and berthed in Nakskov on Oct 18, leaving on Oct 19 at 10 a.m. bound to Fredericia. The "Bornholm" ran aground at midnight on Oct 15, 2017, upon entering the Randersfjord at low tide, being loaded with rocks. The ship failed to refloat with own power at high tide and was in need of tug assistance. The vessel was stuck the entrance to the narrow Kareholm canal. There was no trace of oil spillage. The ship had come from Hellvik, near Egersund in Norway, after having discharged a cargo from Liepaja in Stavanger. A salvage attempt was due to start around 7-8 p.m. and the ship then taken to Randers for inspections.